I have a few things floating around in my brain that I want to get out, here today, at 526 days sober. I have been doing some thinking and a lot of obsessing. Some good, some bad. Such is life, but I am hoping for a breakthrough of some sort soon. I think writing here, in this lovely space, will help that happen. So I have a mishmash of a post here today. I need to clear my brain and let it all go. Thanks in advance for braving through it with me. I have also realized recently, maybe today even, that one of my biggest addictions is trying to control the world around me with obsessive thoughts. I don’t always do it, but when something is bothering me I think about it and worry over it until I feel in my bones that I have determined the outcome one way or another. Something clicked for me today, maybe when I was listening to an episode of the Bubble Hour, but I realized that oh hey, I don’t have to determine an outcome for every so-called problem that appears in my life. I don’t need to figure it all out. In fact, I can’t figure it all out, nothing big ever works the way I plan it, and trying is a huge waste of my time and energy. Epiphany! For example, the past few days I have been obsessing over whether or not I should have another baby. I have thought about the pros, the cons, decided yes, decided no, talked to friends and family about the matter, talked to my husband about it, worried, and stressed. Yes, people do sometimes plan pregnancies or protect themselves against them, but in reality I have limited control over this. Since I have thought about this so much, I know that I will be okay no matter what, that my happiness does not depend in any way on the outcome of this decision, and that the ultimate fate of my uterus is in hands greater than mine. God, the Universe, whatever you want to call it. I am not calling the shots here, even if I desperately want to know what happens in the end. The stories that I tell myself about this subject aren’t helping me, and no matter what happens I will learn something. In fact, I am sure that I will learn valuable lessons no matter what. This is an recent example, but these types of thoughts are pretty normal for me. I need to plan! I need to figure everything out! I am actually really happy with life right now, but I need to get out of my own way. I am ruining my own happiness. What a waste of a short life. It is time to set down this heavy load and let myself be happy. It was these kinds of thought patterns that kept me stuck drinking and numbing. I am not numb anymore, I do not drink anymore, so it is time to let that baggage go. It is time to change. The Serenity Prayer comes to mind. I think I need to hold it a bit closer these days. I feel like I always need to qualify these things by saying that I am not all that religious, and that I don’t go to AA, but who really cares in the end? Sometimes wisdom is just wisdom. 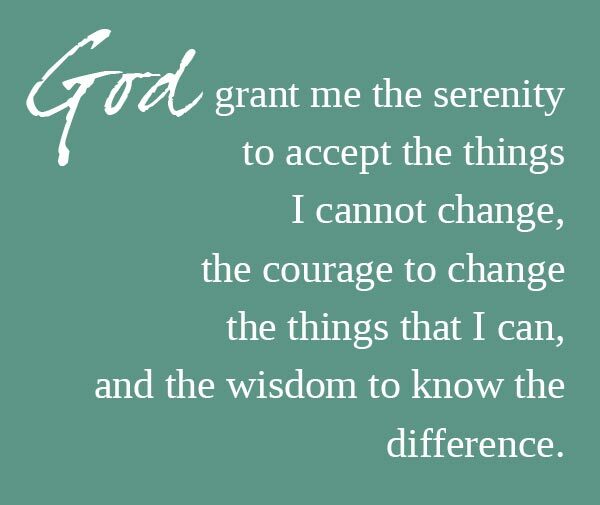 Here is the beginning of the Serenity Prayer if you want to read it, too. Wishing you all serenity today. My baby celebrated his first birthday this weekend, and it made me reflect on how my life would be different if I had not quit the booze. First of all, I probably would have thrown him a party this weekend. I would have felt obligated in some silly way, because I was less secure when I was drinking and I worried more about what people thought about me. You’re SUPPOSED to throw a party for your child EVERY YEAR, right? Or else you’re a bad parent? Um, no. So … my one year-old would have had a party, filled with mainly grown-ups, hanging out. In most social circles one year-olds don’t have a bunch of friends to invite to parties yet. His party probably would have been a good time, but it wouldn’t have been as much about HIM. His wants and needs … not ours. In addition, there likely would have been some drinking involved at this shindig. We would have justified it to ourselves by saying that we ‘deserved’ to celebrate. Heck, we have been parents for a whole year! That IS cause to celebrate! Why do we need to drink alcohol to celebrate, though? Especially when the MAIN event … the person we are really celebrating … has no use for alcohol, parties, and large groups of people at this point in his life. He just wants to hang with the P’s, play with his toys, go for walks, take baths, chase the cats, jump on the bed … you get the idea. Instead, we spent the whole weekend doing things that he likes to do. We saw a few friends, but we didn’t overwhelm him with a large party. We took a couple of nice walks, opened a present every few hours, made banana cupcakes that he smashed and ate, sang songs, read books, played with toys, took naps, etc. It was practically the same as a normal day except BETTER! He was so happy to be with his parents the whole weekend, and we were able to give him 100% of our attention. I didn’t think about drinking hardly at all, except that I was SO happy to be sober. It was perfect. A good introduction to birthdays for him, and no stress for me. I can’t say FOR SURE how things would have gone down had I still been drinking, but I don’t think it would have been quite as nice. Once again, I feel that being sober is a gift you give to yourself and to the important people in your life. It’s always a good reminder.